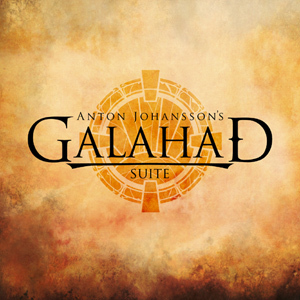 Described as “Epic storytelling with an all-star cast make Anton Johansson’s Galahad Suite one of the best concept albums you will hear in 2013” is rather a bold claim by label by Lion Music and you’d be right for being sceptical with such fanfare, for starters I imagine few have heard of Anton Johansson who played with Mister Kite a few years back, but delve deeper and you’ll discover the fanfare might not be so wide of the mark after all. With a sound that runs across progressive rock/metal, melodic and hard rock grounds with equal measure, “Galahad Suite” is the result of an idea that has been in the head of former Mister Kite member Anton Johansson for almost 30 years and features an array of talented musicians including Linus Abrahamson (guitar and bass), Carl Lindquist (vocals), Mats Bergentz (Drums), Sebastian Berglund (Keyboards), Anna Forsvall Lundmark (Cello) and backing vocal by Evelina Andersson, Ellen Abrahamson and Mikael Cederhag. Is this the all-star cast mentioned previously? Well no, aside from Lindquist most names are new to me, but then we get onto the guest list. How about guitarists Mattias IA Eklundh (Freak Kitchen, Freak Guitar), Magnus Karlsson (Primal Fear, Allen/Lande, Starbreaker), Jonas Hansson (Silver Mountain), Dennis Post (Star*Rats) and Magnus Kristensson (Mister Kite, Planet); along with keyboards by Jens Johansson (Stratovarius, Yngwie Malmsteen, Dio) and Lalle Larsson (Karmakanic, Agents of Mercy, Electrocution 250) and additional vocals by Alf Wemmenlind (Mister Kite, Fifty Grand Suicide), not too shabby eh! But of course names are nothing without a decent end product and boy has Anton conjured up something rather special. As someone sick to death of overblown pompous epics (Timo Tolkki’s Avalon anyone?) this is understated, it has very good songs, a strong story running through and the guest spots are used to enhance the end product, not be the only reason for buying. Production is excellent, strong, powerful and with a crisp mix. 10 tracks which take us from opener “The Hope” to closer “The Man”, each track represents a step in Sir Galahad’s quest, corny? Maybe, but Wemmenlind and Lindquist deliver the lyrics with so much passion and emotion it’s hard to not get caught up in it. The other musicians are uniformly excellent whether its on the mid-tempo opener to the up-tempo and melodic delight that is “The Quest” to the musicality of “The Incident” (Dream Theater fans will love this one) and its breakdown with a superb keyboard solo from Sebastian Berglund. Each track has something to offer new on each subsequent listen and I can see this album staying in frequent rotation for a long time to come. Overall, a very pleasant surpise from Lion Music and congratulations to Anton Johansson, the 30 year wait has been worth it. Check out ASAP (note digital release only). This entry was posted in Reviews and tagged Anton Johansson, Freak Kitchen, Galahad Suite, Jens Johansson, Lion Music, Magnus Karlsson, Mister Kite, review. Bookmark the permalink. Headless were a band that were kicking around in the late 1990’s, they disbanded in 2000 but have seen fit to reform under the watchful eye of guitar duo Walter Cianciusi and Dario Parente, making up the core of the band is vocalist Goran Edman, he of some of the finest pipes to have come out of Scandinavia. Completing the lineup is guest drummer Scott Rockenfield of Queensryche fame for the bands come back “Growing Apart”. 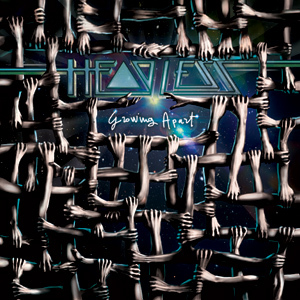 Stylistically Growing Apart sits somewhere between straight metal and hard melodic rock mixed with some progressive elements, all tracks are listenable and accessible from the first spin and to be honest this is a very good collection of songs with good performances from all involved. The promo literature states that the music was built around the drum rhythms of Rockenfield, fortunately this doesn’t sound like musicians trying to lay down music to drum rhythms, instead its well written, focused and with good arrangements. Edman contributes strong vocals and melodies and throws down some interesting vocal harmonies on the likes of “Primetime”, “The Backstabbers Around Us” and the title track. Cianciusi and Parente prove themselves to be more than capable guitarists, who also know the art of restraint when it comes to lead time too. Overall, a good album worth checking out. This entry was posted in Reviews and tagged Göran Edman, Growing Apart, Headless, Lion Music, Queensrÿche, review, Scott Rockenfield. Bookmark the permalink.